It is virtually illegal not to visit iconic Peggy's Cove when visiting Nova Scotia. Click here to book from a selection of Halifax hotels. Halifax is located on the shores of the Atlantic Ocean on Nova Scotia's Eastern border. 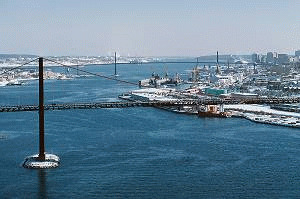 This city of almost 373,000 people is a major economic centre in Atlantic Canada, and its economy is based on government, the Port of Halifax, financial services, telecommunications, manufacturing, retail, and agricultural services. History, culture, nature, and a cosmopolitan outlook around a historically important and busy harbour sums up the spirit of Halifax for visitors. The charming waterfront is a draw, and features The Maritime Museum of the Atlantic. The Museum teaches visitors about Nova Scotia's marine heritage, including artifacts from the Royal Canadian Navy, Canadian merchant marine, and local shipwrecks. A 1913 steamship is also on display, and the HMCS Sackville is nearby. Pier 21, Canada's Immigration Museum, has been voted one of Canada's seven wonders. For more history check out the Halifax Citadel National Historic Site where kilted soldiers march in front of the Army Museum. Several old churches grace the city, including St. Paul's Anglican Church. Dating back to 1818, Province House is the seat of Nova Scotia's government. Point Pleasant Park, on land that reaches out into the Atlantic Ocean, has been a popular site for walking, cycling, and picnicking since 1749. The Halifax Public Gardens are a Victorian public garden and a designated National Historic Site. Nearby, Fisherman's Cove offers opportunities to watch working fishermen arrive ashore with their catch. For a refreshing tour, Alexander Keith's Nova Scotia Brewery offers history lessons delivered by people in period costumes. Discover a sparkling, waterfront Halifax hotel connected to the exciting Casino Nova Scotia. Situated in the heart of downtown, this extraordinary Halifax hotel is steps away from the city's top attractions, including the business district and World Trade & Convention Center. We have a AAA 4-Diamond rating with luxurious accommodations and an abundance of upscale amenities. In the heart of downtown Halifax, The Westin Nova Scotian?s prime location offers a peaceful respite in this beautiful city. The Holiday Inn Express Halifax/Bedford is conveniently located at Exit 2 off Highway 102. Our hotel has easy access to all the businesses and attractions in the Halifax Regional Municipality. Our extended stay property is conveniently located near both business, entertainment centers and the historic waterfront. Everything in downtown Halifax is within walking distance. Whether you are staying for a night, a week, a month or a year our homelike surroundings include spacious suites, luxury bedding, full kitchens and complimentary hot buffet breakfast. In Fall River, Nova Scotia, this French architectural designed, Inn on the Lake features an on-site restaurant. It is 10 minutes from Halifax Stanfield International Airport and has a daily shuttle service. Each guest room features a private balcony or patio with pool area views. This inn is surrounded by 4-acres of Parkland and contains a private beach. We are 15 minutes from historic downtown Halifax, providing easy access to many of the area's attractions and points of interest including the Maritime Museum of the Atlantic and Casino Nova Scotia. This Halifax hotel is also close to Mount Saint Vincent University and Dalhousie University. Luxury sophistication and style have reached a new level in Halifax. A Four Diamond level to be exact. And offering luxury accommodations in the heart of downtown Halifax is what this hotel does best. Whatever brings you to the city, this hotel is confident you’ll find the 200+ refined rooms and suites to be accommodating and out restaurant is award-winning. At the our Halifax, Nova Scotia hotel, guests love our blend of comfort, convenience and value. We have 65 spacious deluxe guest rooms and two room suites, free deluxe continental breakfast, free wireless internet service, free movies, free local calls and morning newspapers, indoor pool, exercise room and outdoor patio. Enjoy our indoor pool and, for a healthy lifestyle, use our exercise room. These Halifax heritage townhouses have been cleverly combined to create this charming boutique hotel. Signature dining and individually appointed guest-rooms make this hotel a favorite downtown retreat in Halifax. Twenty nine rooms and suites of various sizes with complimentary breakfast and wireless Internet access. An ideal setting for your downtown spring getaway. With stunning views of the historic harbor in Halifax, this all-suite hotel has relaxing facilities in an ideal location in the city's business district. The hotel features an indoor pool, hot tub and a fitness center. After an intense workout, guests can relax in the sauna. For on-site dining, Ryan Duffy's restaurant is open for breakfast, lunch and dinner. Our cozy hotel is conveniently located near the Robert Stanfield International Airport. For your convenience, our hotel provides you with a free 24hr/day airport shuttle and long term parking options are available. The Aerotech Park, Air Canada, Enterprise Car Rental and IMP Corp are all nearby. Our Halifax hotel features an indoor heated mineral pool with a fitness centre. History comes alive at this cozy boutique bed and breakfast hotel, located in Halifax, Nova Scotia, only minutes away from the downtown and harbor areas.